Following the grace of Daniel saving BattleTonia from certain Battlemageddon, the kids awaken in the convention hall with some very confused and excited Japanese BattlePet players. They manage to escape in the confusion and continue on their way to Sucrose Park, making a late-night stop at a small town hotel. Following much hijinks (and attempted monster cannibalism? 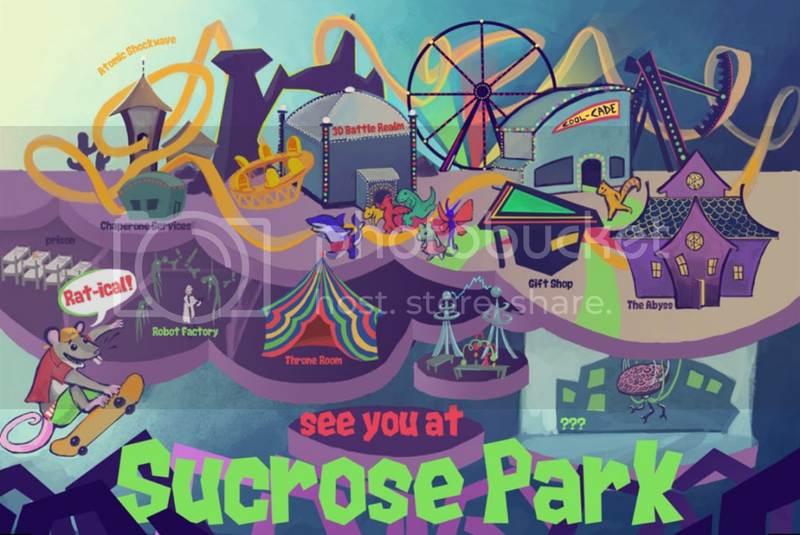 ), the kids get to Sucrose Park the next day. The kids enter into the park looking for lost kids and secret underground robot factories, but mainly looking for fair food and park rides. It’s not long before they run into the park’s main mascot, Coolrat. He’s bright, cheerful, able to skateboard and juggle simultaneously, and always willing to throw candy to kids. In fact, he seems a little eerily into our heroes. . . Note: I was in the midst of a terrible sinus infection when I ran this game, so it’s very short and kind of sloppy. This entry was posted in Monsters, Road Trip and tagged coolrat, matt, monsters and other childish things, road trip, urban fantasy. Bookmark the permalink. Follow any comments here with the RSS feed for this post. Leave a trackback: Trackback URL. Was Nurse Ratchet a reference to “One Flew Over the Cuckoo’s Nest”?